Paleo crepes made easily in your blender! This quick recipe requires only 5 minutes of prep (no refrigeration time!). 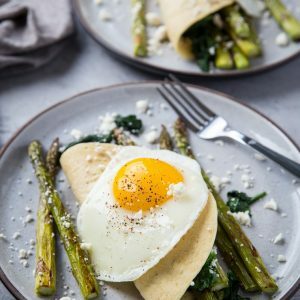 Serve them up with roasted and/or sautéed vegetables for a savory crepe experience. This post is sponsored by Thrive Culinary Algae Oil. The first time I made Grain-Free Crepes, I thought for sure there was no way they could possibly turn out like regular crepes. Lo and behold, they are just as soft, spongy, malleable and delicious as the real deal! …To the extent that I double dog dare you to serve them to friends and family and see if they can tell the difference! How do you like to serve your crepes? When I was a kid, all I cared to put on my crepe was butter and pure maple syrup. As an adult, I’m super into the savory crepe for either breakfast or dinner. Or mid-afternoon snack, because that’s how I roll. 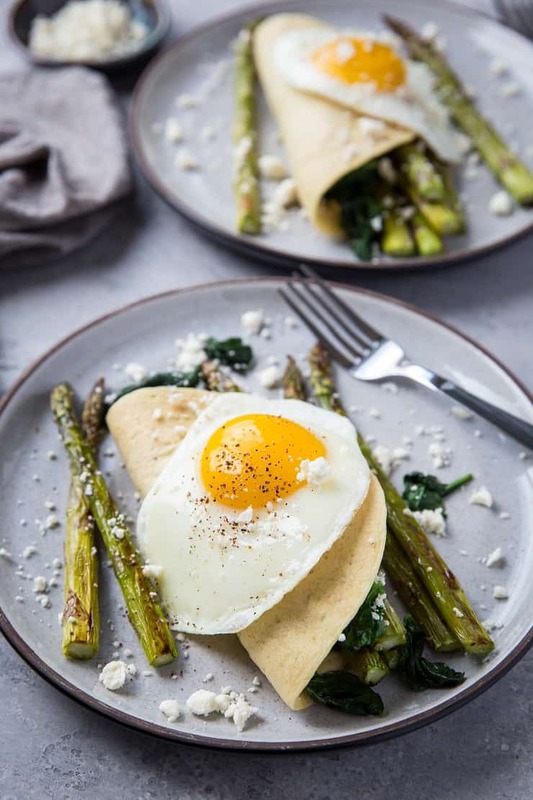 For these savory paleo crepes, I roasted up some asparagus using Thrive Algae Oil and also used the oil for sautéing a ton of spinach, cooking some sunny side up eggs, and for cooking the crepes. 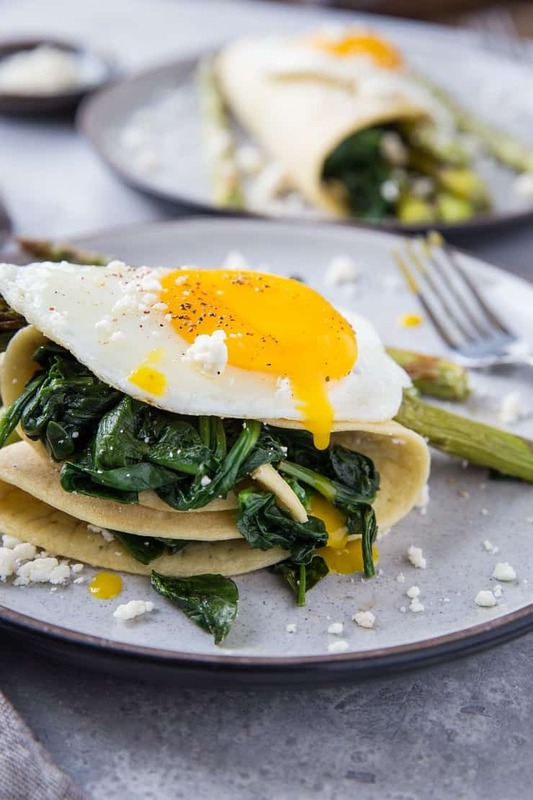 Once everything was cooked to perfection, I stuffed the crepes with the spinach and roasted asparagus, sprinkled liberally with feta cheese, and topped it off with an egg. MAGNIFIQUE! I’ve been using Thrive Algae Oil for quite some time now. Because it is both subtly delicious in flavor and has a mega high smoke point (up to 485 degrees F!! ), I find it perfect for not only roasting and sautéing, but also for using in dressings and marinades. 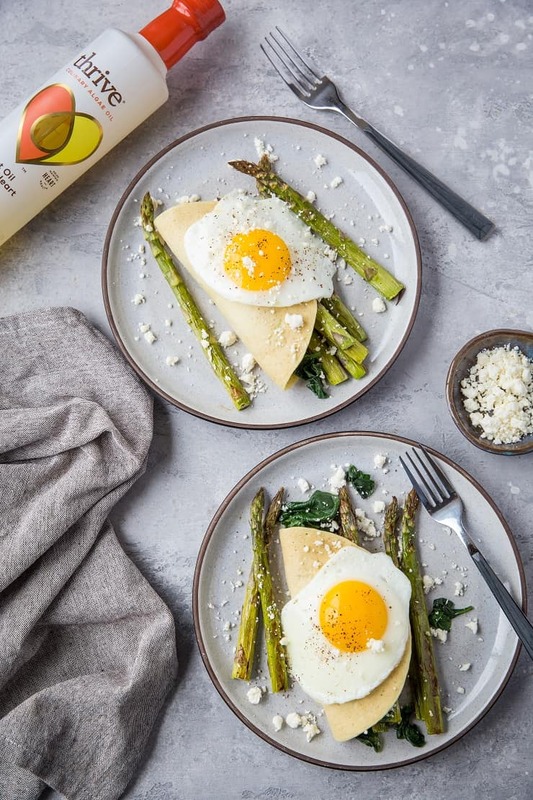 In addition to its versatility, Thrive also contains the highest monounsaturated fat content of all cooking oils – even higher than olive oil and avocado oil! And it only contains about 4% saturated fat, the lowest of all cooking oils. Without sounding like too much of a broken record, not all fats are created equally. Aiming for unsaturated fat like the fat found in Thrive Algae Oil is a wise choice for those who are looking to maintain or optimize their nutrition. 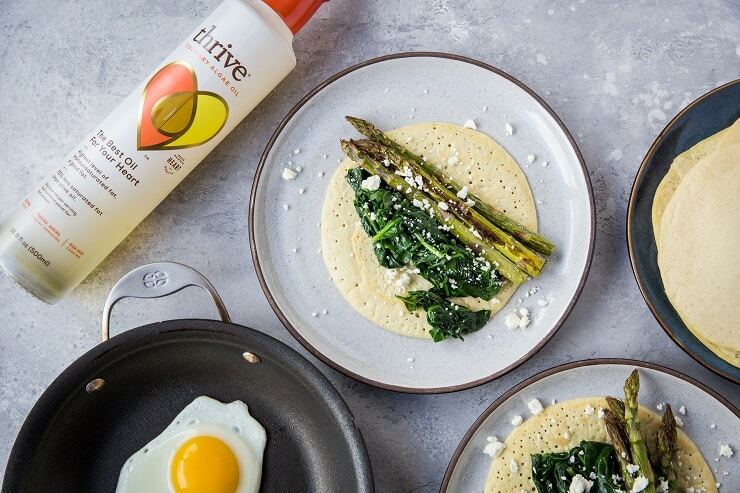 If you want to give Thrive a try, you can order it on Amazon or find it in the cooking oil aisle at several major grocery stores! Let’s make some crepes, shall we? 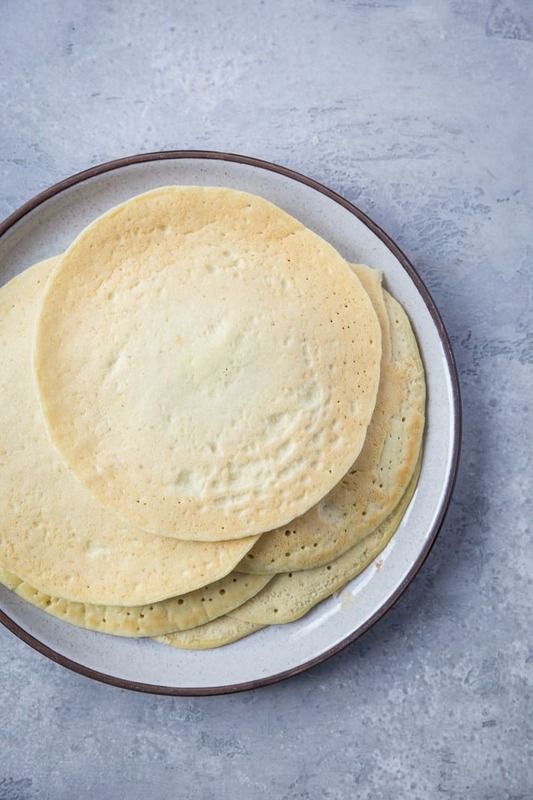 The batter for paleo crepes is crazy easy to prepare and requires ZERO chill time in the refrigerator, unlike crepe batter made with all-purpose flour. Simply add the ingredients for the batter to a blender, blend until smooth, and you’re good to go! Heat a small amount of Thrive Algae Oil in a non-stick skillet over medium-low heat. Wait for the skillet to get hot all the way! Pour ⅓ cup of batter in the center of the hot skillet slowly, allowing it to pool outward into a perfect circle. Cook until bubbles rise to the top of the crepe, then carefully flip it to the other side. Continue cooking 30 seconds to 1 minute longer. Repeat this process for the rest of the batter and get ready for the crepe of your dreams! From here, simply add desired amount of sautéed spinach, roasted asparagus and feta cheese to the crepe. You can fold it like a taco or fold it over again to make a triangle shape. Top with a sunny side up egg and devour! Note: This recipe makes 9 medium-sized crepes, so if you’re living in a crepe-loving household, I do recommend doubling the recipe! The crepes freeze well, so you can always do a make-ahead breakfast situation. Drizzle with hot sauce or homemade chipotle sauce for a kick. Use chard or kale in place of spinach. Roast up additional vegetables for even more color and flavor. Replace the feta cheese with gruyere, gouda, blue cheese, or any of your favorites. Sauté ½ an onion and/or 3 cloves garlic with the spinach. 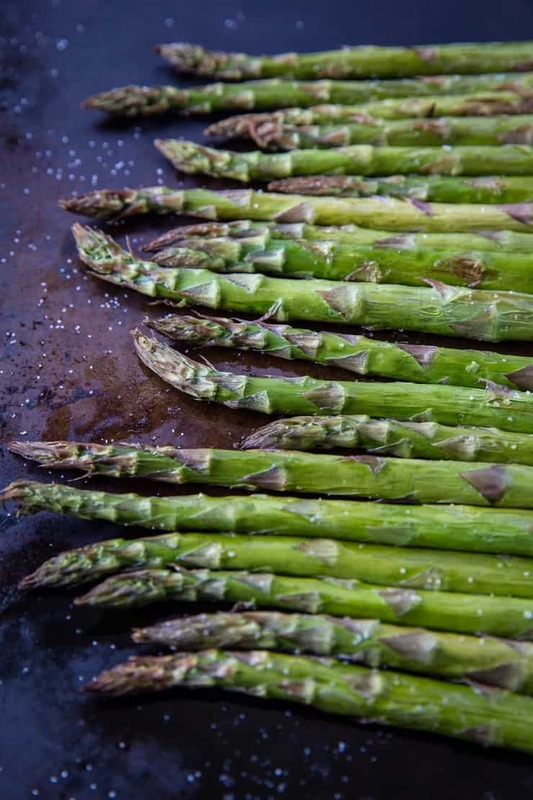 Preheat the oven to 415 degrees F.
Trim the rough ends off the asparagus and spread on a baking sheet. Drizzle with 1 tablespoon algae oil and sprinkle with sea salt. Use your hands to toss everything together until asparagus is well-coated in oil and salt. Roast in the preheated oven 15 minutes, until asparagus turns bright green and is still al dente. Remove from oven and set aside until ready to use. Heat 1 tablespoon algae oil in a large non-stick skillet over medium heat. Add the baby spinach and cover. Cook, stirring occasionally, until spinach has wilted, about 2 to 3 minutes. Sprinkle with sea salt to taste. Cook desired amount of eggs using your desired methodology (sunny side up, fried, or scrambled). Add all ingredients for the crepes to a blender and blend until smooth. Heat a small amount of algae oil over medium-low heat in a non-stick skillet or griddle. Once the skillet it completely hot, measure out ⅓ cup batter and pour slowly in center of skillet, allowing the batter to naturally funnel outward into a circle. Cook until many bubbles rise to the surface of the crepe and the sides firm up. Carefully flip and cook an additional 30 seconds to 1 minute, just until crepe is cooked through. Repeat for remaining batter. 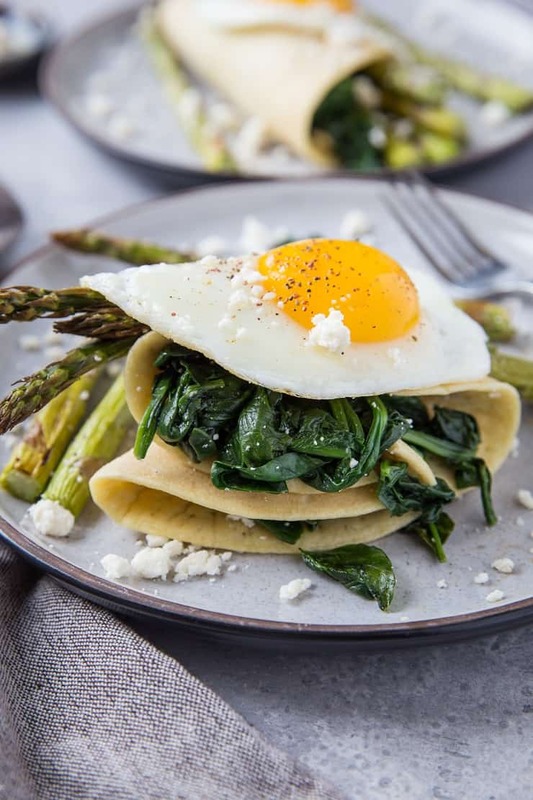 Compile crepes by filling with sautéed spinach, roasted asparagus spears, and feta cheese. Top with an egg and serve!